interesting work week in London! Schedule for the meetings room in the CD area. Twitter feed for the #mozlondon hash tag. Poll and feedback for the magnet experience. Links to the best coffee shops or best pubs in London. And also we gave away lots of beacons for people to advertise themselves. It was really nice, and soon we will analyse all the data that we got from this experiment. 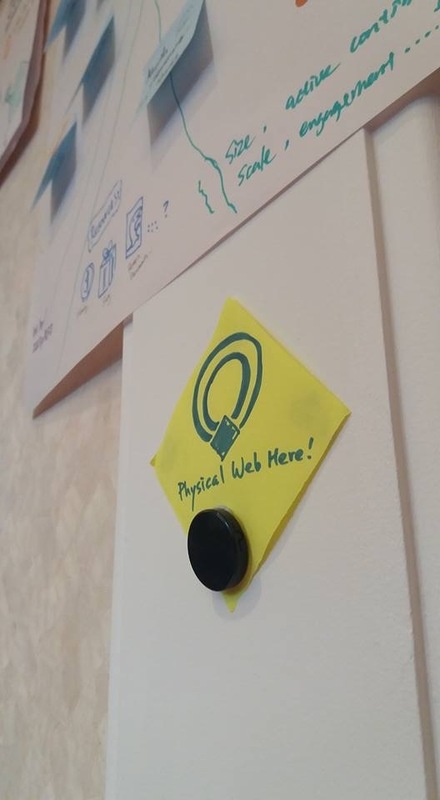 As well we have time to meet with the Activity Stream Team and other teams inside mozilla to discuss about a common solution for simplifying how we can have a ‘tile’ representation of a site. Also we must remark how useful was the meeting with the MozFest team to engage about possible collaboration with the festival. Take a look to the data in the metrics server (launches, url clicked, url swiped) and the metadata server. Contact the people that gave us their email addresses. We need to contact Irina from the research team to try to have a deep dive in beacon technology. How are we going to do this? We should not flood the user with notifications. When? At the moment of discovery, in a daily digest and story of the web founds during a day? How we can reduce the friction of the beacon configuration? Shortening service with beacons already preconfigured against this service. What is our next experiment? We should put time to discuss where are we going to test magnet again. If we want to try magnet with more users we need a proper way of distributing our apps. Even if they are tagged with a big BETA ribbon on the side. We need to check if something like that is possible in iOS (in android it is). And triage the legacy errors that we already got. We still can try to get a deal with the Chinese that is providing beacons to Google, we just need to plan this in advance and be clear of our needs.